The new Iraqi cabinet headed by Haydar al-Abbadi has been approved by the Iraqi parliament. Abbadi has 3 deputies and 23 ministers, with some portfolios still not named. The programme of the new cabinet, approved by 177 votes, is very general. Still, it goes further than past governments in terms of underlining the need for decentralization as well as implementing reform in the Iraqi armed forces. All of this seems to represent recognition of past failures, which at least constitutes a good first step. It seems clear, though, that no major promises have been issued along the lines of the pompous Erbil agreement of 2010. In itself, perhaps not a bad thing. Also the timing of the whole process is admirable, for the first time entirely consistent with the Iraqi constitution. In terms of ministries, Shiite Islamist parties have taken the lion’s share, including several particularly important portfolios. These include Ibrahim al-Jaafari as foreign minister and Adel Abd al-Mahdi of ISCI as oil minister. In addition to the premiership, the State of Law bloc of former PM Maliki also has the portfolios of health, education and work. Fadila continues to control the ministry of justice. Whereas ISCI was awarded additional ministries, Badr and the Sadrists seem to have only two each, though the Sadrists also control one of the three deputy premier positions. Badr was at one point on the verge of boycotting the entire session after they were denied the interior ministry portfolio. As in previous government formations, the PM kept these portfolios for himself, though promising to present candidates within a week. Sunni and secular representation is largely by individuals affiliated with the broad coalition associated with current parliament speaker Salim al-Jibburi and previous speaker Usama al-Nujayfi. Together, they hold around 7 ministries, all of them service-oriented (plus Saleh al-Mutlak as deputy PM). The movement of previous Iraqiyya leader Ayyad Allawi, which has remained separate, does not seem to have more than one portfolio. As in previous government deals, the Kurds have a relatively low number of portfolios, around 3, but these include the heavyweight ministry of finance. They also have one deputy PM as before. A separate chapter relates to three vice presidents approved today as part of the package. The Iraqi presidency proper is a mostly symbolic position, whose main responsibilities largely end with the successful formation of a new government. The vice presidents have even less power, and it is an ironic sight to now have three major players in the previous term – Nuri al-Maliki, Ayad Allawi and Usama al-Nujayfi – in these sinecure-like positions. On a legal and constitutional note, parliament speaker Jibburi made it clear during the vote that he intends to follow a supreme court ruling that says “absolute majority” in the Iraqi constitution means “absolute majority of those present” as long as “absolute majority of parliament membership” is not expressly mentioned. After the new deputy premier Saleh al-Mutlak got less than an absolute majority of the total members, Jibburi simply stopped specifying the exact number of votes received, only referring to the fulfilment of a majority of those present. Exactly like in the sessions to vote for parliament speaker and his deputies, though, the votes that were counted, including the approval of the government programme, were in the range of 140-180 Yes votes, out of altogether 289 MPs reportedly present. This seems to indicate that whereas all blocs may have supported their candidates and made a strategic decision to be inside the government, wholehearted enthusiasm is still not widespread. The international community has largely welcomed the new government as somehow being more “inclusive” than past ones. This is largely inaccurate as far as ministerial appointments are concerned. The ethno-sectarian balance, which seems to be the prime interest to these commentators, remains largely the same as in the Maliki II government. Security portfolios remain unoccupied. Those who care about sectarian balances will also note that the Sunnis have lost the sole “sovereign” ministry they held (finance, now held by the Kurds). What has improved somewhat, though, is the size of the government (it has been reduced in size by at least 25% compared with past governments), as well as the political language emphasizing the need for reform. To what extent Abbadi means business will be seen over the coming week, when candidates for the key positions of defence and interior ministers have been promised. Maliki in 2010 also issued such promises, only to keep the portfolios for himself or close friends acting as ministers without parliament approval for the duration of his term. 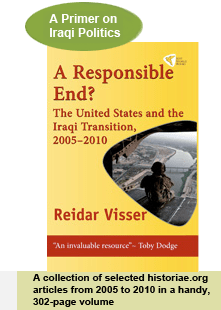 That, in turn, formed the basis for many of the accusations of over-centralization and mismanagement of the Iraqi security forces that ultimately prevented him from a third term.